The Avatar’s adventures continue right where the TV series left off, in this beautiful, oversized hardcover of The Promise, from Airbender creators Michael Dante DiMartino and Bryan Konietzko! Aang and friends must join together once again as the four nations’ tenuous peace is threatened in an impasse between Fire Lord Zuko and Earth King Kuei! 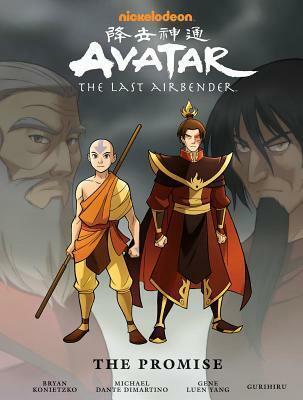 As the world heads toward another devastating war, Aang’s friendship with Zuko throws him into the middle of the conflict! Featuring annotations by Eisner Award-winning writer Gene Luen Yang (American Born Chinese) and artist Gurihiru (Thor and the Warriors Four), and a brand-new sketchbook, this is a story that Avatar fans need in an edition they will love! If you Loved Avatar the Last Airbender, you’ll love this. It combines all three parts of “The Promise,” and gives you oodles of annotations and behind the scenes info of our precious ATLA! Netgalley I love you, I do but DAMN FIX YOUR RESOLUTION. My version was barely readable. Despite that I loved this. Toph and Sokka are still mega BAMFS. Aang and Katara were nice to see, Katara mellowed out and Aang serioused up. Lol. Zuko again for the last time, IS NOT EVIL. While I love this story and this edition of “The Promise” (and I know they are working on this…) but CAN WE FIGURE OUT WHAT HAPPENED TO ZUKO’S MOM ALREADY? !